In the seventh pAsuram, parAnguSa nAyaki‘s mother thinking about her daughter’s tender nature and her weakened state due to the separation from emperumAn, says “we need to think about what she will go through on entering there, only if she can reach there”. olgi olgi nadandhu enganE pugungol osindhE? nedumAl – Oh one who has great love! pugum kol – will she reach there? My daughter who is having eyes with overflowing tears, confused heart, is calling out “Oh one who has great love!” during night and day which are having goodness; further to such longing, she is contracting, swaying, walking and weakening, and left for thirukkOLUr where he is resting and is having abundance of wealth; how will she reach there? malgu nIrk kaNNodu maiyal uRRa manaththanaLAy – While both the senses which, as said in periya thiruvandhAdhi 23 “enREnum katkaNNARkANAdha avvuruvai nejennum ut kaNNERkANum” (The form which cannot be seen by the external eyes, can be seen by the heart which is the internal eye), are unstable, how will she reach there? Eyes became abundantly teary; heart became confused. If both the internal vision and external vision become covered in darkness, how will she go there? Due to the tears in the eyes, she cannot see with her eyes; due to being blinded by love, she cannot see with her heart. malgu nIrk kaNNodu maiyal uRRa manaththanaLAy – The tears identify the eyes and the confusion identifies the heart. maiyal uRRa manaththanaLAy nedumAl enRu azhaiththu – She called out even without the help of the heart. 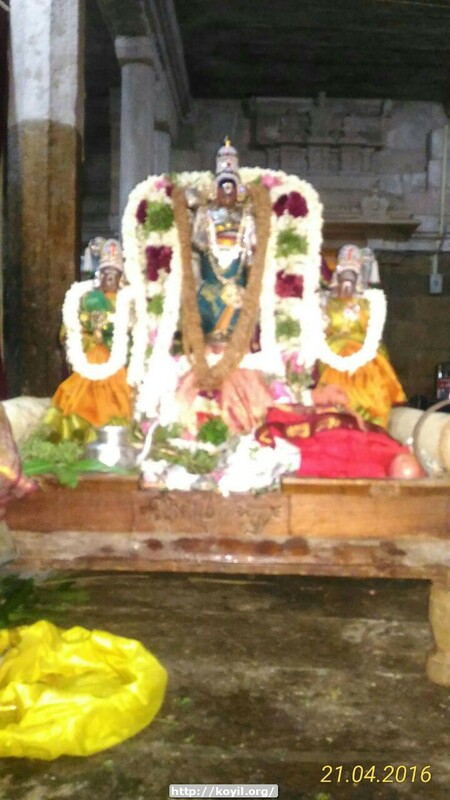 allum nan pagalum – Since this is the time when she calls out for bhagavAn, being engaged in his matters, she calls it good night and good day. While the worldly people are engaged in lowly sensual pleasures and call out for such pleasures, this is the time when she calls out saying “ellAm kaNNan” (everything is krishNa). nedumAl enRu azhaiththu – Calling him out highlighting his great love towards her. inip pOy – After calling him out highlighting his great love towards her, now she is going there to highlight her great love towards him. At this stage of being with eyes which don’t see and heart which is captivated [by him], is she going to enjoy anything else going there? selvam malgi avan kidandha thirukkOLUrkkE – It is due to his arrogance of being very wealthy, he did not come half way across, glance at her and embrace her! If he did not have such arrogance, would he not have come all the way towards her? She is saying that he could have enjoyed her even during the journey but lost the opportunity due to his arrogance. selvam malgi avan kidandha – As said in SrI rAmAyaNam sundhara kANdam 3.24 “samayA bOdhitha: SrImAn …” (SrI rAma, who was blissfully sleeping, was awakened by me), where he is very beautifully resting. avan kidandha – She went to see his beautiful resting posture which is said in the same SlOkam “sukasuptha:” (blissfully sleeping); it is said in thirumAlai 23 “kidandhadhOr kidakkai” (beautiful resting posture). avan kidandha – How amazing! Instead of her waiting for his arrival, he is awaiting her arrival! olgi olgi nadandhu – It appears that she has to walk ten steps to cross distance of one sep.
olgi olgi nadandhu – osindhu – enganE pugum kol – Walking with great difficulty, becoming weakened even being unable to walk in that manner, how will she reach there? nadandhu enganE pugum kol – The mother is thinking that even if her daughter walks, she will not reach. [Why?] She is thinking that since her daughter walks like a swan as said in periya thirumozhi 11.2.5 “annamennadaip pUnguzhali” (one who gracefully walks like a swan and has beautiful hair), she will not reach there. This entry was posted in thiruvAimozhi, thiruvAimozhi 6th centum on March 17, 2018 by Sarathy Thothathri.